Charlie Sheen aiming to trademark 22 catchphrases. Duh, it's a winning move. 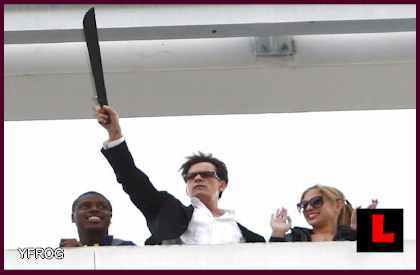 Unlike many of Sheen’s decisions over the past few months (like, oh, wielding a machete), I actually applaud this move. After all, it makes more sense than when Paris Hilton made “That’s Hot” her own and when Donald Trump tried to tradmark “You’re Fired,” a phrase originating in the late 18th century that is said by nearly everyone in the world at least once. Because even though the homeless man in the alleyway by your apartment may be just as creative, the phrases “Violent Torpedo of Truth” and “Rock Star from Mars” are undeniably all Charlie. Why shouldn’t he profit off of his (incredibly frightening) imagination? Of course, we’ll have to wait and see to find out how a “Vatican Assassin” trademark will affect whatever Dan Brown’s next book will be. I predict a novel full of ™s. Charlie Sheen’s 20/20 interview spoof: Funny?